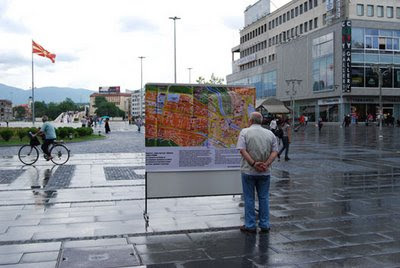 Zoran Poposki’s latest project, PUBLIC SPACE: Right to the City (2008-2009), was presented at the main city square in Skopje, Macedonia, on 23 June 2009. Utilizing situationist tactics and focused on a collective utopian intervention into urban geography, this year-long participatory art project explores issues of “ownership” of public space, as well as citizens’ power to “write” urban memory as represented by the names of public space in the city of Skopje, thus reappropriating the urban landscape which belongs to all citizens. As a space shared by all citizens, public space is one of the main sources of local identity. Furthermore, public space is where citizens communicate and interact with each other and become engaged in public matters, and is thus a precondition for public freedom. Thus the right, as well as the necessity, for the citizens to use public space as something which belongs to them and as a place for public debate and engaging in public discourse. 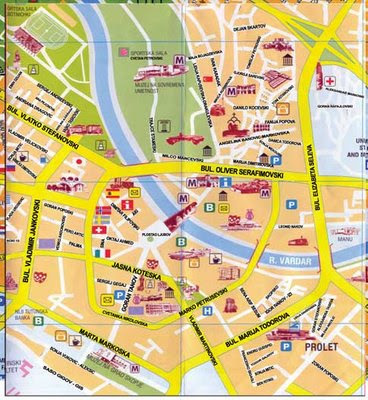 The city of Skopje is not defined by its buildings or other facilities. This city is defined by its inhabitants, with their family ties, labor relations, with their knowledge and actions. It is not made up of the past, but of the present which is continuously being created by the people living in it. Public spaces in the city, such as squares, parks, streets and bridges, which belong to all citizens, should reflect that fact. They should carry the names of people living and working in this city today, celebrate each one of us and not just historic figures. They should mark important dates in our lives, and not the past. - our favorite things, such as colors, sounds, activities, etc. Please submit your proposals along with a brief explanation (no more than half a page) online at www.public-space.info or mail them to CC Tocka, 6 Antonio Grubisic, 1000 Skopje. All proposals will be forwarded to the Skopje City Council. Let’s make this city truly ours. In the second stage, realized as part of the Skopje Cultural Summer 09, all proposals by the citizens of Skopje collected in the previous nine months were included in a new map of Skopje, exhibited as a billboard on the central square in Skopje for a period of one week, along with a one-day performance by the artist. 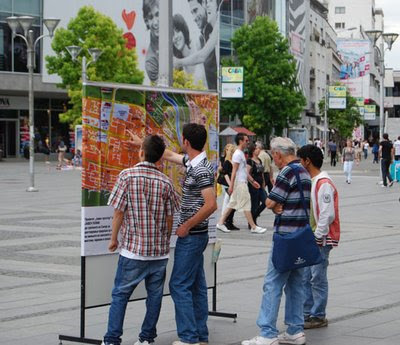 A survey of passers-by was conducted, to explore their opinion on public spaces in Skopje and solicit new proposals. All collected proposals, with documentation of the process, will be officially submitted to the Skopje City Council.